On June 21 and 22, 2017, Fraunhofer FOKUS business unit FAME attended the “Screenforce Days 2017” at the Coloneum in Cologne. The new marketing event for TV and moving images with about 2500 participants informed about the highlights of the TV season 2017/2018, including their moving images and marketing strategies. In addition, it offered some insights into the newest technologies like virtual reality, addressable TV and 360° videos. 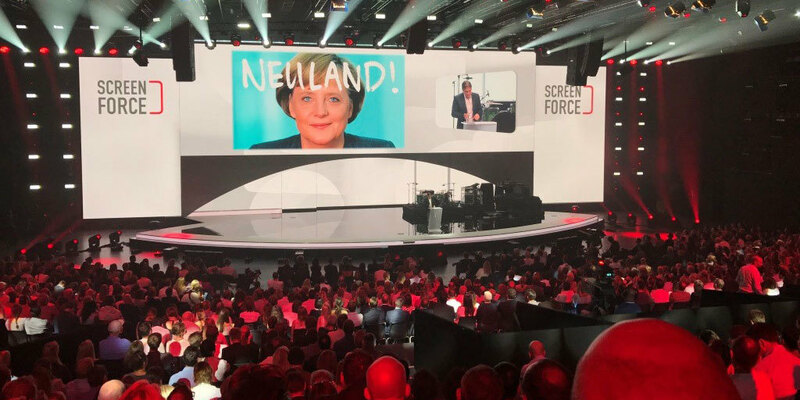 Screenforce, formerly Wirkstoff TV, is an initiative of 12 TV marketers in Germany, Switzerland and Austria for TV and moving images. Together they represent 95 percent of the German speaking TV advertising market and focus on the relevant research, marketing and communication for TV and moving images. At the Screenforce Days on June 21 and 22, 2017 a combination of individual program screenings and an inspiring congress program was offered. This was possible thanks to the participation of more than 40 TV channels and top speakers of the media industry. Next to the main subjects concerning branding, marketing, advertising impact and moving images it was possible to visit the technological laboratory to get informed about the newest technological developments. In this context during both exhibition days Fraunhofer FOKUS presented different use cases covering the topics “Addressable TV”, “360° Video On Home TV” and “Synchronized Media Playback”. Additionally a “360° Video Cube” was installed to showcase highend 360° Video streaming in 16k. The Cloud-based 360° Video Playout for HbbTV allows the experience of 360° videos on TV screens and any other low capability video playback device. This is enabled through rendering the 360° video content in the cloud and only streaming the individual field of view to the receiver. In this course the bitrate is reduced dramatically, which creates the possibility of high quality 360° video experience on any device.